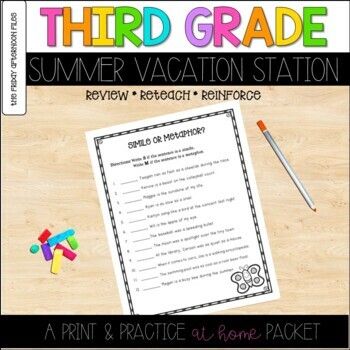 This engaging pack is full of activities to review, reteach, and reinforce basic third grade skills. While this unit was designed with third graders in mind, it could certainly be used to introduce concepts to advanced second graders. In addition, please don’t let the summery theme throw you--many of the pages could be used throughout the year without seeming out of season. In addition to a reading list and reading log, there are 28 student work pages and full-size answer keys included. Reading List of 40 titles recommended for 8 and 9-year-old readers. Includes Grade Level Equivalent, Lexile, DRA, and Guided Reading Levels for each title.